My main research interest is Human-Computer Interaction (HCI), focusing on making the user experience more natural, seamless and integrated into the physical world. I have entered a Master of Math in Computer Science program at Cheriton School of Computer Science at University of Waterloo with a certain goal in mind — to make a contribution to the field of HCI and to narrow a gap between humans and machines by developing intelligent systems that try to understand their users. At that point, I was especially interested in the research of my advisor Jesse Hoey: smart technologies that use Artificial Intelligence to interact with cognitively disabled older people. I have became involved with ePad project which is aimed to develop and improve a customizable multitouch creative arts device for Alzheimer’s patients, and this project has exposed me to the exciting world of Natural User Interfaces (NUI) and multitouch devices. I have explored various hardware methods that enable multi-finger tracking on large surfaces and have even upgraded my advisor’s multitouch coffee table by changing its sensing setup from FTIR to DSI. This hands-on experience has given me a better understanding of the current state of sensing technology, its strengths and drawbacks. 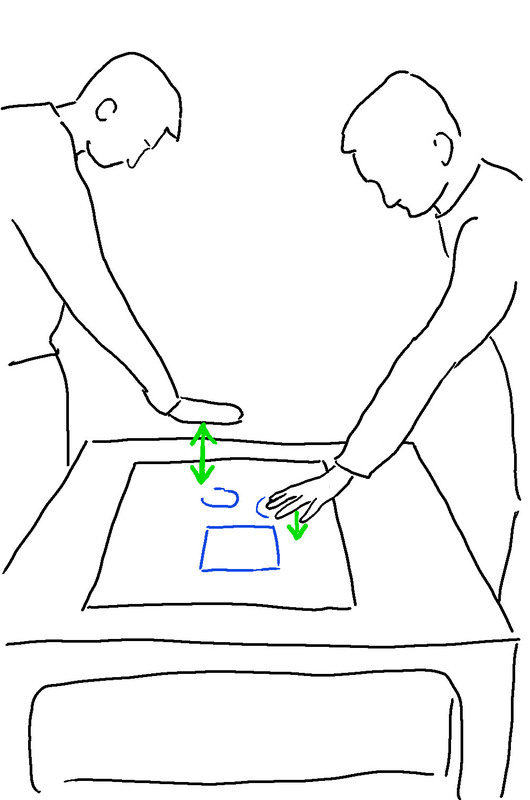 Later I have observed the upgraded table’s ability to detect human palms at some distance above the surface of the table. Wishing to take an advantage of this ability, I have developed a vision-based tracker (using C++ and frameworks OpenCV and ) that is able to track both on-surface and above-surface objects (see figure on the left). 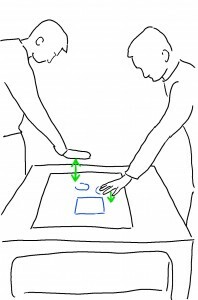 This tracker has enabled me to study the ways people may interact with a multitouch surface by moving their hands above it, and therefore it inspired the further direction of my research. 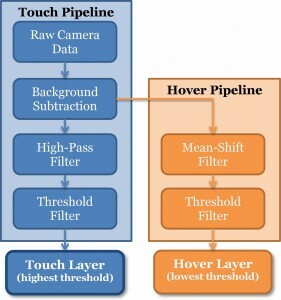 When I became interested in studying this above-surface interaction, Mark Hancock became my co-advisor and helped me to narrow my research towards the problem of item selection for above-surface interaction. 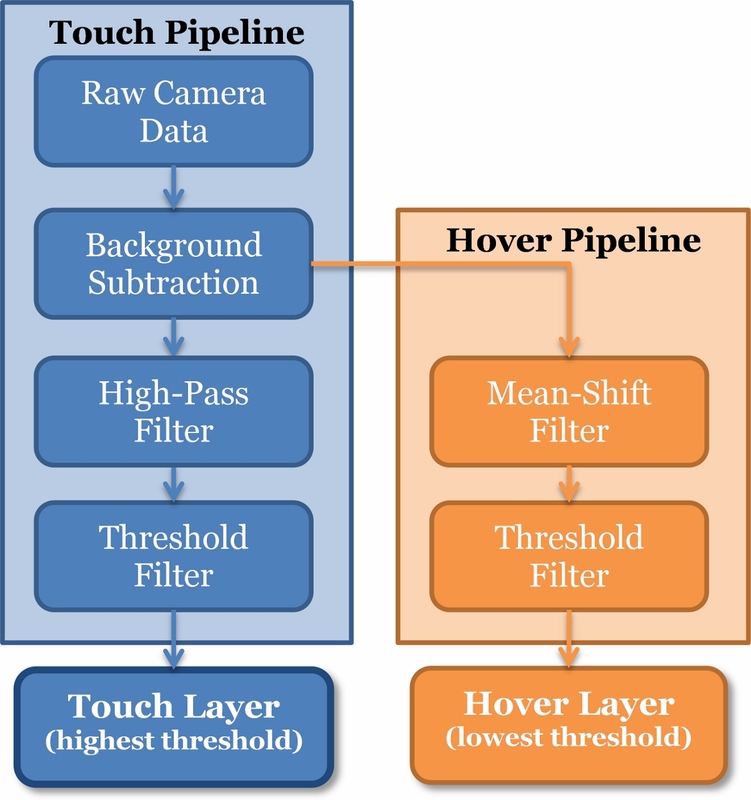 I have conducted two user studies: first to elicit gestures for above-surface selection from a group of users and then to evaluate the performance of several gestures. This research have formed my Master’s thesis titled Investigating Selection above a Multitouch Surface. Some other research areas that I would like to explore are: collaborative systems, ambient information displays, augmented reality, autonomous mobile robots (ground and flying), intelligent multi-agent systems and many more.